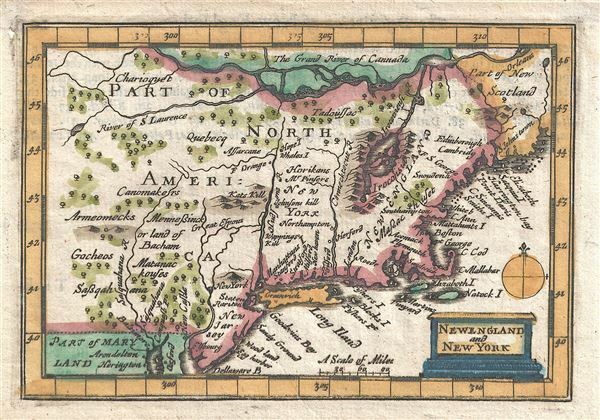 An attractive 1675 miniature variant on John Speeds rare miniature map of New England and New York issued by Thomas Bassett and Richard Chiswell. This map was included with the popularly termed 'miniature Speed,' an octavo version of Speeds great folio atlas. Like its larger cousin, this map was cartographically derived from Jan Jannson's 1651 Belgii Nova but updated with Anglicized nomenclature and toponymy. It thus follows in the model of Jansson-Visscher Series, notably the absence of Lake Ontario, weak illustration of the St. Lawrence, Lake Champlain offset to the east, and Cape Cod level with Manhattan, etc. Issued by Bassett and Chiswell for inclusion in their 1675 octavo An Epitome of Mr. John Speed's Theater of the Empire of Great Britain and of His Prospect of the Most Famous Parts of the World. Thomas Basset (1637 - 1699) and Richard Chiswell (January 4, 1640 - May 3, 1711), publishing as Basset and Chiswell, were English booksellers and map publishers active in the latter half of the 17th century. Though both Basset and Chiswell worked independently, their most significant cartographic accomplishment was their joint purchase of John Speed's map plates, from an enigmatic figure known only as Willoughby, in 1675. Basset and Chiswell, working in concert, added and expanded Speed's Theatre of the Empire of Great Britaine, publishing a new and influential edition of the atlas in 1676. Following the publication of the Theatre the partnership dissolved, the Basset and Chiswell imprint appearing on no subsequent maps, and both went on to separate careers. Basset published several other works and ran a bookstore on Fleet Street, London, until declaring bankruptcy in 1696. He died just a few years later in 1699. Chiswell was somewhat more successful, publishing numerous maps and books well into the 1700s. He was praised and admired by his contemporaries; one of whom, John Dunton, writing in 1705 comments that Chiswell "Well deserves the title of Metropolitan Bookseller of England, if not the whole world. His name at the bottom of a title-page does sufficiently recommend the book. He has not been known to print either a bad book, or on a pad paper". Chiswell died on May 3 of 1711 and is commemorated by a monument, erected by his son and still visible in St. Botolph-without-Aldgate Church. Speed, John, An Epitome of Mr. John Speed's Theater of the Empire of Great Britain and of His Prospect of the Most Famous Parts of the World, (London: Bassett and Chiswell) 1676. Very good. English text describing New England on verso. A couple of old tape marks on verso. Original platemark visible. Burden, P., The Mapping of North America II, #458. McCorkle, B. B, New England in Early Printed Maps 1513 - 1800, #675.8.